Whether the need is picker fed, beside the press granulators or batch feed granulators of parts and runners, the GRS series deliver what plastics manufacturers have been seeking for years; excellent regrind quality, low maintenance and operating costs, and a wide window of operation. The GRS series is a continuation of the ARG angled rotor granulator series that has been highly successful in the United States and worldwide, selling over 25,000 units since its inception. The new GRS series continues the tradition of Getecha's proprietary angled rotor design with either 7 or 10 blade rotors. The special angled rotor design, maximum cuts per revolution, low rotor revolution (200 RPM standard) and continuous cutting circle combine to assure an excellent quality regrind with low fines and a highly consistent particle size, even with highly filled engineered materials. The design of the angled rotor, coupled with the slow rotor speed provides the optimal combination of factors to provide the best regrind you can get from a granulator - bar none! In side-by-side, customer located granulator tests, the Getecha GRS granulators have time and again outperformed our competitors units - hands down with fewer fines, more consistent particle size, elimination of longs. 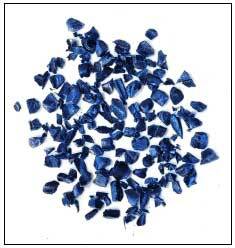 The GRS Series is used throughout the world for a variety of materials. From the softer Santoprenes to extremely high filled (65%+) materials, and everything in between! You no longer need different granulators for different materials. The GRS series launches Getecha's divided, drop-down cutting chamber (see photo) that provides immediate, tool-free access to the rotor, hopper, screen and entire cutting chamber. This feature provides for incredibly fast black to white clean-out times of 5-10 minutes. This feature dove tails perfectly with the demands of today's quick material change applications and lean manufacturing practices. 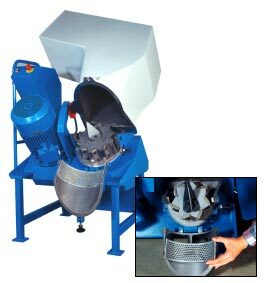 The GRS series granulators also include the popular optional system for the elimination of longs or "thrues", even with runners as small as an eighth of an inch in diameter. Ask you sales person for more details about this sub $300 option. 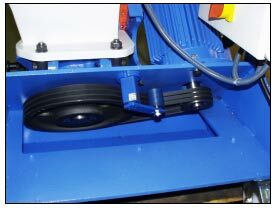 The GRS series offers as standard rotating rotor end plate. 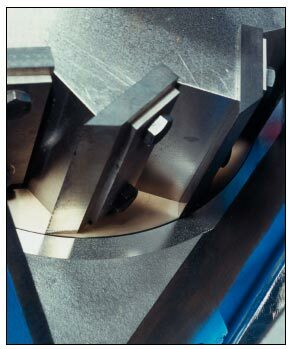 By turning the end plate with the rotor, the trapping of material between the two is no longer possible. Trapped material results in several negative effects: shortens the life of the unit, mills harder materials to dust, smears softer materials for regrind and heat degradation, makes full clean-outs next to impossible. Eliminate your problems with a rotating rotor end plate and start realizing the benefits of better quality regrind! End plate turns with rotor. Other wear packages available for hardened hoppers and discharge devices based on extreme customer needs. The GRS series is a dream for maintenance departments with its virtually maintenance free design. With the exception of changing or sharpening blades (with new blades being self-setting), the unit can be placed into operation and virtually forgotten about for five or more years. There are no lubrication points and the incorporated self-tensioning belt device (see photo) eliminates the constant need for re-tensioning belts on others granulators. The sealed bearings combined with a rotating, flush mounted rotor endplate virtually eliminate potential bearing issues. The result is an overall savings of actual maintenance time on a per unit basis versus competing units. 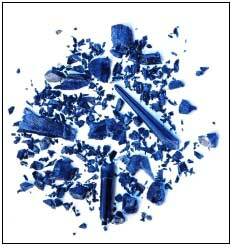 Less labor, lower costs, reasonably priced spare parts means a more profitable granulator. 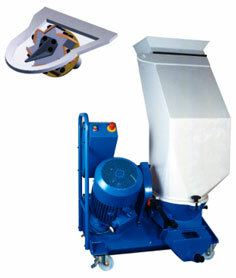 The GRS granulator series can be configured to meet your individual needs.